backatage, at The Adrienne Arsht Center for the Performing Arts. 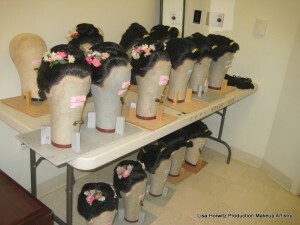 I am working with my friend Carol, hairstylist extroidanaire, with the wigs for The Miami City Ballet’s 25th anniversary season. First up, an amazing dance called “Bugaku’. It is a Japanese dance with fantastic costumes and wigs. The issue, and of course there is one, is that this piece is being performed as the second of three dances. 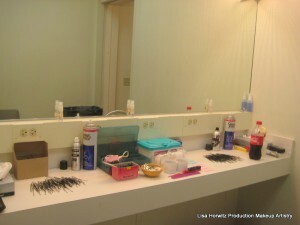 This means that during a twenty minute intermission Carol and I have about ten to twelve minutes (after the dancers’ costume change) to put on ten top heavy wigs and make sure that they are REALLY secure before they go back onstage. If you do the math that gives us about a minute per wig – not too stressful! There are actually twelve dancers and wigs, but luckily two of the dancers are not in the first performance, so we can apply their wigs ahead of time. It’s all a bit stressful if I do say so myself. Next up, The Broward Center for the Performing Arts, in Ft. Lauderdale and The Kravis Center for the Performing Arts, in West Palm Beach in November. Then in February it’s off to The Naples Philharmonic Center for the Arts.